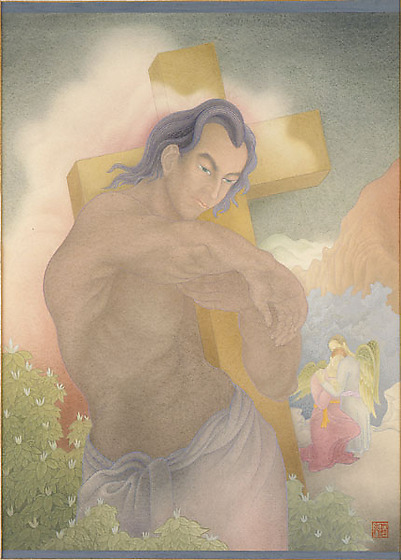 A barechested man with long unbound hair carries a large, yellow cross. His lower body clothed in red and grey hued wrap. A reddish mist surrounds him as he stands among green plants with small grey-white flowers. In the background, an angel in grey with lavender belt and green wings embraces another angel in red with and orange belt and green wings at lower right; behind them appear blue clouds and brown and green mountains in the distance. "One painting was about the war. But you don't see the war. It's a crucified cross. Because its calle, Again, crucifying humanity. It's Second World War. That's my picture." --Hideo Date, interview, Queens, N.Y., 17 November 2000.